Gruden says 1st team will play 8-10 plays Thursday, maybe more, "depending on my satisfaction"
DeSean Jackson out with what looks like ankle injury. Garçon already sitting out along with Ryan Clark. Welp RT @Redskins : WR @DeSeanJackson11 walks off the practice field with a wrap on his left ankle. Update from Coach Gruden after practice. The Washington Redskins Training Camp is underway in Richmond, Virginia. 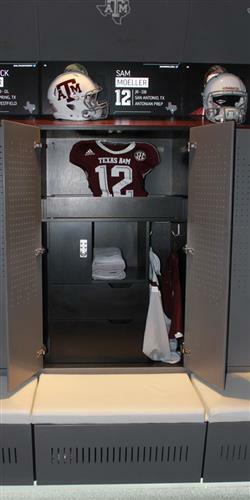 WASHINGTON -- Texas A&M University is making its pitch to the top recruits in Texas and around the country by showing off its new facilities on Twitter. Each player’s locker includes an LED screen showing the student-athlete’s name, position, hometown and yes, even Twitter handle. But wait, there’s more. 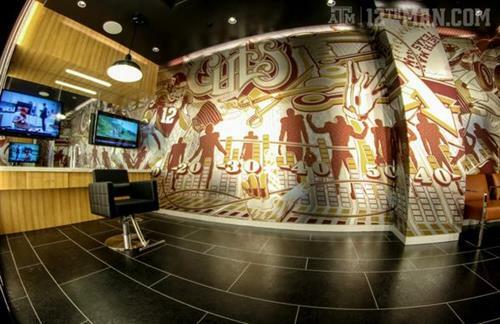 Here are a couple more shots of the facilities, which are part of a $20.8 million renovation project. 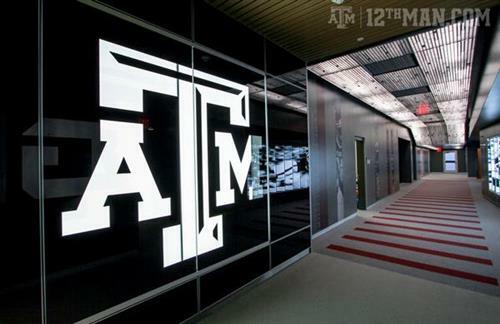 That, of course, comes in addition to the $450 million worth of upgrades to Kyle Field, the home of A&M Football. WASHINGTON -- The Baltimore Orioles made a late splash in the trade market, acquiring prized left-handed reliever Andrew Miller from the division-rival Boston Red Sox, the club has confirmed. Miller has been one of the best relievers in baseball this year, posting a 2.34 ERA and striking out 69 batters while allowing just 38 baserunners 42.1 innings of work. In exchange, Baltimore sent minor league lefty Eduardo Rodriguez to Boston. The 21-year-old was 3-7 with a 4.79 ERA in 16 starts at Double-A Bowie this season. The Orioles have acquired LHP Andrew Miller from Boston in exchange for minor league LHP Eduardo Rodriguez. WASHINGTON -- In the final hour before the non-waiver trade deadline Thursday, the Washington Nationals acquired shortstop Asdrubal Cabrera from the Cleveland Indians in exchange for infielder Zach Walters. The trade was first reported by Indians beat writer Jordan Bastian, while Paul Hoynes had the Nats’ return in the trade. The 28-year-old Cabrera, who also played second base earlier in his career, owns a career .270/.331/.410 slash line, but has seen that drop to .246/.305/.386 this season. Walters, 24, has played in just 40 Major League games, but hit 29 home runs in just 134 Triple-A games last season. UPDATED: The Nationals also received cash considerations as part of the deal. The Indians will pay the remainder of Cabrera's $10 million contract. WASHINGTON -- A recent poll indicates that following last year’s 3-13 debacle of a season, Redskins fans expect only a modest improvement this season. Vox Populi Polling found that 48 percent of the 701 D.C. area residents they surveyed who consider themselves ‘Skins fans expect the team to win between six and nine games this season. That’s nearly twice the number (25 percent) that expect them to win 10-15 games. Six percent of those polled are fatalistic about their team’s futility, expecting three wins or fewer. Meanwhile, three percent are delusionally optimistic, predicting an undefeated season. 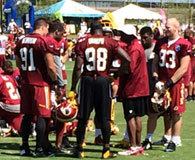 For updates on Redskins Training Camp, check out George Wallace’s daily reports from Richmond. 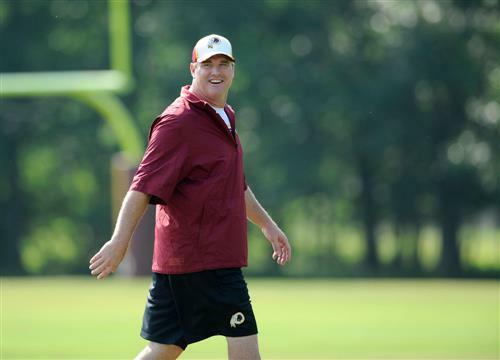 WTOP's George Wallace kicks off his Redskins Training Camp blog as Jay Gruden opens his first camp as a head coach. Say this about the El Paso Chihuahuas -- they appear to be having a good time. The Triple-A affiliate of the San Diego Padres is playing its inaugural season after moving from Tucson and rebranding as the diminutive canines. In addition to showing us a propensity for next-level jersey design, the team has gained notoriety for the early-season prank pulled on veteran Jeff Francoeur, in which teammates convinced him that Chihuahuas pitcher Jorge Reyes was deaf. Now, they’ve pranked Francoeur again, locking him in the coaches’ bathroom, which he was not supposed to be using. Francoeur may have gotten the last laugh, though. 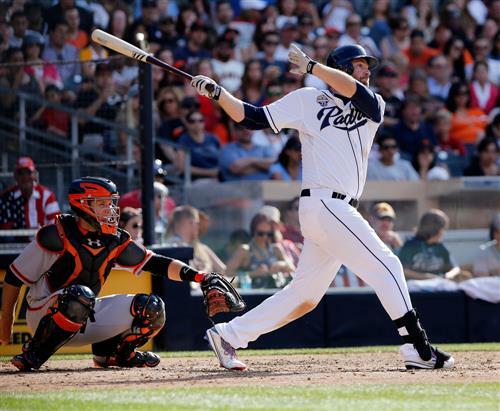 The Padres purchased his contract on Wednesday. WASHINGTON -- The New York Yankees acquired third baseman Chase Headley from the San Diego Padres Tuesday in exchange for infielder Yangervis Solarte and minor league pitcher Rafael De Paula. CBS Sports' Jon Heyman first tweeted the move, which has been confirmed by the Yankees. Headley, 30, addresses an immediate need at third base for the Yankees, but is having a sub-par year. He is just two years removed from a fifth place finish in the NL MVP vote, but is slashing just .229/.296/.355 with 12 doubles and seven home runs so far this year. The move answers questions for a Yankees club that is tied for second in the AL East, four games out of first place. But Headley will be a free agent at the end of the season, so the trade does not appear to have any immediate implications in regards to Alex Rodriguez, whose suspension will end at the conclusion of the 2014 season. Solarte hit .254/.337/.381 with six home runs in 75 games for the Yankees this year. De Paula was 6-5 with a 4.15 ERA and 104 strikeouts in 89 innings in 20 games with Class-A Advanced Tampa Yankees. WASHINGTON -- There are jerseys, then there are jerseys. Minor League Baseball, long known to push the envelope when it comes to promotions, may have broken down a new barrier in jersey design. The El Paso Chihuahuas, the new Triple-A franchise in Texas’ far west border town, will feature jerseys with a giant Chihuahua face across the front. Not a logo, not a drawing, a photo of a giant Chihuahua. 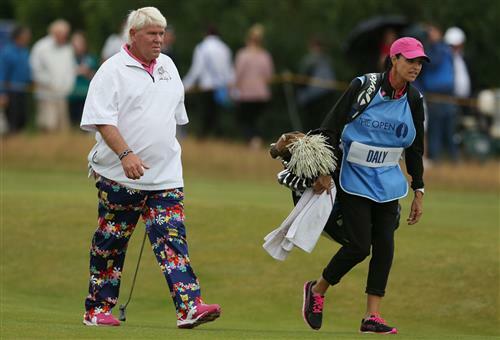 WASHINGTON -- John Daly has brought his pants game to the British Open. The day before the field tees off at Royal Liverpool, Daly has been seen stalking the course in, wait for it, SpongeBob SquarePants pants. Or is it just SpongeBob Square…pants? Click on the image below to see a close-up of Daly’s threads. WASHINGTON -- Self-serving beer? It may sound like the future, but it will be a reality for fans attending the 2014 All-Star Game at Target Field in Minneapolis, Minnesota Tuesday. 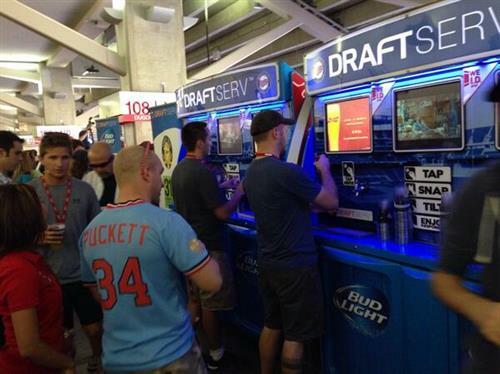 Fans can purchase a $10, $20 or $40 card and purchase whatever size beer they want by the ounce. According to NBC News, Budweiser and Bud Light will run 38 cents an ounce, while higher end brands Shock Top and Goose Island 312 cost 40 cents an ounce. WASHINGTON -- Television ratings for the Washington Nationals have taken a dive this year, a trend that could impact both the current MASN negotiations and the long-term possibilities of the Nats getting their own regional sports network (RSN). According to SportsBusiness Journal’s July assessment, the Nationals are averaging just a 1.90 rating this year, down 34 percent from last season. This is particularly troubling in Washington, as the Nationals and Orioles have yet to renegotiate their current contract with MASN. The Nationals are looking for a larger piece of the revenue pie than they have been receiving since the initial incarnation of the deal was struck in 2006. But, while the Orioles’ draw is down seven percent overall this season, their total draw has now passed the Nats’ once again. The SBJ article’s primary focus is on the precipitous drop in ratings for the Los Angeles Dodgers in their first season on their new RSN. There are several different potential factors, but a lack of distribution for the channel (only carried on Time Warner Cable in the LA market) has been the biggest challenge. Such a challenge could also face the Nationals if they decide to eventually break away from MASN to create their own RSN. The Houston Astros have faced similar issues with their own network, though some of the trouble has been attributed to the team’s lack of a quality on-field product and other competing sporting events. But for the same problems to hit the Dodgers -- a storied franchise coming off a division title, and one that sits in first place in the NL West heading into the All-Star break -- portends larger issues for other clubs. WASHINGTON -- The Boston Red Sox have a had a rough season following their World Series win in 2013. But young center fielder Jackie Bradley Jr. may be giving them reason to hope for the future. Bradley turned in one of the top highlights of the season Wednesday in Boston, getting a tremendous jump and laying out to rob the White Sox’ Tyler Flowers of extra bases. Was it the catch of the year? Decide for yourself. I hope this turns into a hammering, Brazil have had this coming. Every team I love have failed me so far, Brazil you are apparently no different. I can't quite believe my eyes. This is appalling from Brazil. Erm. It's another. 4-0. Kroos and Khedira carve the defence apart and it's not good. Not good at all. So embarassing. Kroos with the goal. AND YOU WON'T BELIEVE IT! It's 3-0. Kroos slams it left footed into the bottom corner. Disastrous for Brazil. They are self destructing. Brazilian defence all over the show. 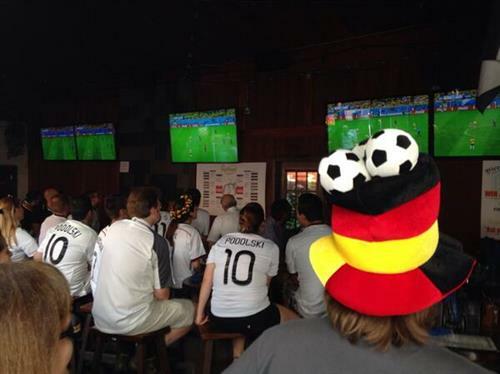 Lovely link play between Kroos and Klose. It was too easy. Brazil are up against it now. 17 Mins - It's all boiling over a bit here. Lahm with a great tackle on Marcelo in the German area and Boateng loses the plot. It's counter attacking stuff here. Think the Brazilians only know how to attack. 14 Mins- This is end-to-end stuff but Brazil are leaving themselves wide open at the back.